Lagazuoi EXPO Dolomiti is a brand new location for exhibitions and meetings in a spectacular scenery. The exhibit space Lagazuoi EXPO Dolomiti has a total surface area of 2842 ft². It comprises 4 rooms, spread over 3 floors which are connected by a panoramic elevator. The conference room is equipped for Meetings, Incentives, Congresses and Events and can host up to 50 people. The building has also a lobby with coffee bar, a ticket office and a merchandising area. Restaurant and accommodation is provided by the Lagazuoi Refuge, the highest and the largest mountain hut in Cortina d'Ampezzo. 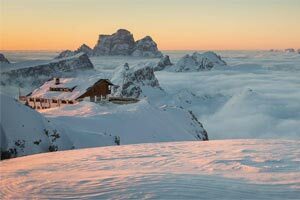 It's situated just 50 metres from the upper station of the cable car and from Lagazuoi EXPO Dolomiti. It offers a bar and restaurant with 100 seats inside / 200 on the terrace and 74 beds. The refuge boasts the most panoramic terrace in the Dolomites. The organization of recreational and team building activities is entrusted to our experienced mountain professionals. The cable car, the entire building and the Refuge are handicapped accessible. Lagazuoi EXPO Dolomiti can be easily reached in three minutes by the modern and fast cable car departing from the Falzarego Pass, at 2100 m above sea level on the Road of the Dolomites. The exhibition and conference rooms are available from December to April – from May to October. Build value in limitless height!